It’s not often I plug stuff in my blog, but then it’s not often I take this particular show on the road, and while I’ve been making fairly frequent spoken-word performances in recent months, THE PLAGIARIST: REWIRED is no simple spoken word performance. It’s entirely fitting that I should be participating in the re-run of Wire Wool 1 that ran a couple of months ago. 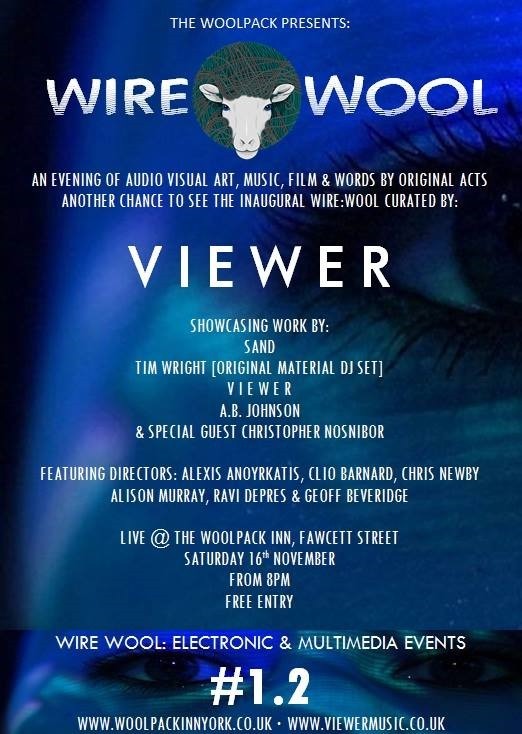 Curated by VIEWER, a band I’ve championed because they’re seriously good and not because they’re friends of mine (although they are) Wire Wool features music by SAND accompanied by some fucked-up visuals, incisive social commentary and intersections courtesy of AB Johnson and DJ sets by Tim Wright (of Viewer / Sand who’s previously recorded under the Tube Jerk moniker)… and my brain-malting multimedia explosion. Brace yourselves and be there… details below. And yes, it really is free. I’ve also found a handful of numbered copies of THE PLAGIARIST in that I’ll be flogging or willing to exchange for beer.